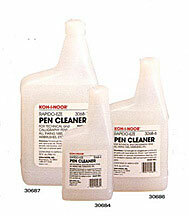 Is formulated to provide a faster, stronger cleaning agent for technical pens, plotter points and airbrushes. Safe to use and will not harm plastic or metal pen parts. 8 fl. oz. bottle.